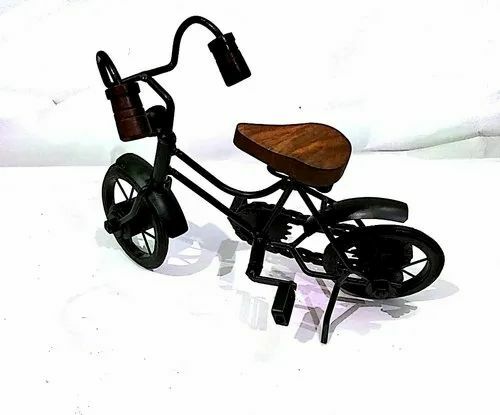 Our product range includes a wide range of Wooden Metal Cycle/Bicycle, Handcrafted Wrought Iron And Wooden Rickshaw and Home Decorative Metal Art Work of Miniature Cycle in Black. Bring home a fusion of style and beauty with these handmade wooden craft. This will increase your decor value if you also place them as a show piece can be gifted during house warming ceremony, birthday. Can be gifted to friends, relatives. This will bring a fusion of style and beauty to your home. The outside carving gives them an indigenous appearance and helps in creating an exceptionally elegant appearance. This decorative bicycle is fabricated with high quality materials and crafted by skilled craftsmen from rural area of India. This decorative bicycle is replica of the original bicycle. This decorative bicycle adds beauty to every decor and enriches the beauty of the surroundings.